Mr. Go is the talk of the town. On July 24th, during the launching ceremony of the 1st Busan Film Investment Cooperative (the Busan Film Commission’s approx. USD 5million investment fund for films shot in Busan), the main topic amongst Korean film producers was the box office setback of Mr. Go. The mega project which rang up a budget of approx. USD 25 million in production costs and called for more than 150 VFX specialists and four years of hard work took everyone by surprise when it landed at a humble third place in the local box office during the film’s opening weekend, scoring 967,000 admissions as of July 28th. Nonetheless, a score that falls short doesn’t mean that the prospects and accomplishments of the 3D technology this film has put forward should be devalued as it clearly advanced the level of 3D in Korean films that has been slightly stalled after the release of Sector 7 (2011). 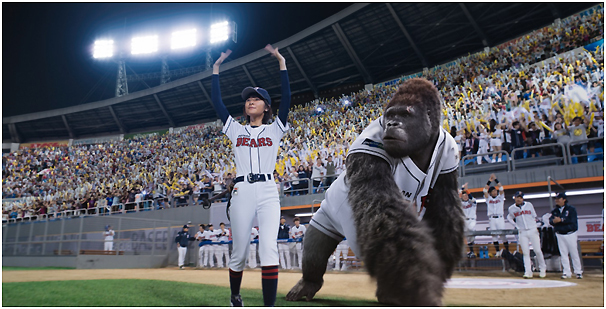 Mr. Go follows the story of gorilla Ling Ling as she challenges the world of Korean professional baseball. The film’s gorilla character was created into a 3D CGI which was applied to real live action images. Unlike Avatar (2009) and King Kong's (2005) digital characters that simulated human movement in areas such as the eyes and facial muscles through a ‘facial motion capture’ technique whereby mini cameras are attached to an actor’s face, Mr. Go applied animation techniques to create behavior, frequent gestures and movement of the gorilla character. Actor KIM Hong-rae did perform the dramatic motions for gorilla Ling Ling’s movements and expressions in certain scenes while fully collaborating with the animation artists as action director. As Mr. Go’s 3D process required the execution of two pipelines including full 3D photography and digital character-creating VFX at the same time, it was inevitable that the film needed more time to finish. 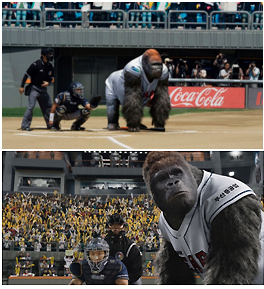 It seems natural that the film’s fundamental nature as a baseball film posed a major challenge for the production team to come up with the most lifelike presentation of a gorilla playing baseball. 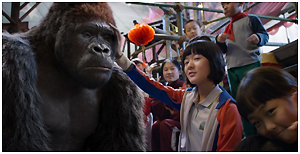 Two gorillas, Ling Ling and Rating appear in the film. Ling Ling is a batter who can hit any ball while Rating is a pitcher who can throw a fast ball at a rate of 200km per hour. Specifically, to present the frequent ball-hitting scenes, the camera abandons the general TV broadcast full-shot style and goes directly into the field to capture the sensation of watching the game right near the plate. In order to enhance the dynamic aspect of the baseball scenes, the production team followed two major principles for their 3D work. First was to go for a 3D effect that went deep into the screen instead of bursting out of it. And second was to enhance the depth of space. The cinematographer in charge of all the 3D images, KIM Jae-ho, developed a Multi-IO method that could express deep spatial depth in long shots, and prevent the flattening effects of close-up shots. This is by setting the depth budget of foreground and background differently. Accordingly, acquiring as much intensity of radiation to enhance a three-dimensional effect became a key goal. To achieve this, director of photography PARK Hyun-chul chose a Red Epic camera that could create sharper and brighter images over the Red One camera he used for his previous film Take Off (2009) while director of lighting LEE Suk-hwan tripled the number of high-intensity radiation LED lights compared to the number used on regular film shoots. As a result, the film succeeded in emphasizing a rich three-dimensional depth in the scene halfway through the film when the camera raced to gorilla Ling Ling on the plate for a full-shot as well as dynamically capturing her commanding force. In many ways this can be compared to director KIM Ji-hoon’s 3D film Sector 7. The 3D style used in Sector 7 basically presented subjects coming out of the screen. Set on an oil prospecting rig required the film’s brightness to remain quite low. The lack of spatial depth along with subjects continuously bursting out of the screen quickly strained the eyes. Claims of the film’s brightness being too low key after the press screening called for a readjustment of the 3D balance and the postponement of the public release date. However, this didn’t mean that the 3D effects MoFac Studio created in Sector 7 were seriously flawed. On the contrary, within the capacity of the Korean film industry at the time, it was an ambitious attempt that did not get enough support from a script that required some improvement and unfortunately flopped at the local box office. Whether or not this affected the industry is hard to tell for sure, but the fact is that not a single Korean commercial 3D film went into production until Mr. Go. 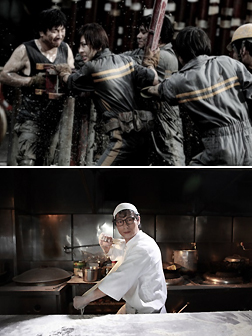 In the indie scene, director LEE Gun’s short film The Shaolin Chef 2 funded through KOFIC’s 'Support for Production of Experimental Short Films with Cutting-edge Technology' program, and PARK Hong-min’s indie feature A Fish (2011) were shot in 3D. The most technological accomplishment in Korean 3D technology that Mr. Go achieved is creating a system that can systematically manage the 3D and VFX process. A legacy that has been started by the production company of Mr. Go, Dexter Films also known as the ‘WETA digital’ of Korea, was not just a post-production company but also the multi-tasking system that controlled all aspects of Mr. Go. Unlike the conventional way of separating the processes between cinematography and post-production including VFX, Dexter Films set up a new 3D production which handled the entire spectrum from 3D photography system selection and budget management to 3D photographic technology process development that was devised in collaboration with the camera team. The 3D producer’s role to act as a liaison between other parts for effective communication and efficiency is generally practiced in both Hollywood and the Chinese-language industries, but for the Korean film industry this was the first attempt. WON Dong-yeon, CEO of REALies Pictures, comments on the merits of Dexter Films, “As their system controls the general process from project development stage through 3D photography to post-production including VFX, it sorts out unnecessary work and also assists the entire process to flow efficiently.” Supervisor at Dexter Films, JUNG Sung-jin also states, “By the time Mr. Go was finished, the VFX specialists at Dexter Films had risen leaps and bounds in their expertise. The key point is having the ability to determine whether a job should be done in facial capture or by optical method and our artists have worked themselves to death to acquire this technique for the past three years. And this is what is important.” He also added that once such the ability to determine the right decision is achieved, the Korean film industry’s 3D and VFX technology will be able to step up to the level of that in Hollywood. This might be a mega project that started out with a great goal but ended with unsatisfactory results, but the film’s 3D technology will serve as a foundation for Korean film industry’s 3D to expand into the future.